John’s remains are being worshipped by Muslim’s in Syria. 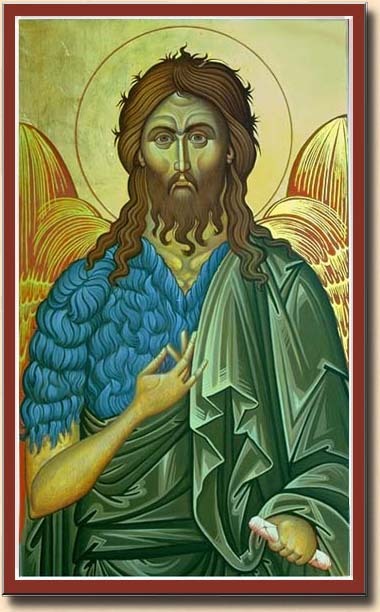 John the Baptist was born of the two priestly Levite lines. His father was of the linage of Moses, and his mother of Aaron. Gabriel appeared to his father when he was near the Ark, and another Angel appeared to John’s mother. These are the two Angels of the Ark of the Covenant that was brought out by the First Born Sons in accord with Reubenite Priesthood, that was altered when the Philistine’s captured the Ark and the Khorite Choir. What they wanted was child to be born who knew UNALTERED TORAH. When John was eight days old, the ousted Nazarite Priests of Reuben came to ask John’s name. There is a argument among his parents as to what his name will be. Zachariah was ordered to remain silent around his unborn son, who was filled with the Holy Spirit while in his mother’s womb. It was believed John would speak PERFECT TORAH when born, meaning he would know what God had ordained, that was later altered. This was a Holy Recovery! THE INFANT JOHN MADE SIGNS, and asked for a slate. He wrote his name, the name of his embodiment. He then spoke this name. As God is my witness! The Nazarite Judge gave his verdict – from the mouth of a babe! When King Herod heard of the miracle, he ordered the round-up of all THE FIRST BORN. This order was overridden by Rome. Herod gave the same order on his deathbed, and all THE FIRST BORN were herded into the hippodrome that he lined with archers. Again, the order was not given. However Saul-Paul the Herodian was hired by the offspring of Herod to hunt down ‘The First Born of Reuben’ and be done with this pesky priesthood, forever. Paul’s mission was a success, until this day, until this very hour! The Koran has Jesus speaking the moment he is born. Why is there no mention of this miracle in the New Testament? There is, in the birth narrative of John the Baptist, but it has been altered and concealed. I have come to open your eyes, your ears, and your mouth to the Truth! The Koran got it wrong! John was the second coming of Elijah preaching about the coming Judgement Day – that never came because John was beheaded. “The man old in days will not hesitate to ask a small child seven days old about the place of life. For many who were first will become, last, and they will become one and the same. the Messiah, or Elijah who will prepare the way for the Messiah. in the case of the rebirth of Elijah, and the birth of the Messiah. On the eight day God may break the seal He put upon the Chosen One’s lips, and a Child, who is least, will lead the Congregation. Behold! the angels said “O Mary! Allah giveth thee glad tidings of a Word from Him: his name will be Christ (Maseeh) Jesus the son of Mary held in honor in this world and the Hereafter and of (the company of) those nearest to Allah. She said: “O my Lord! how shall I have a son when no man hath touched me?” He said: “Even so: Allah createth what He willeth; when He hath decreed a plan He but saith to it ‘Be’ and it is! “And Allah will teach him the Book and Wisdom the Law and the Gospel. I was born on October 8th. during an amazing star shower. family, into an eastern location. Spirit. He went to her in the form of a human being. [19:23] The birth process came to her by the trunk of a palm tree. grieve. Your Lord has provided you with a stream. you have committed something that is totally unexpected. children, was the RESTORATION of the true Torah. The Gospelof Thoams POINTS to the truth DIVNE INFANTS who could speak, and were filled with the Holy Spirit, is the foundation of the Christianity, and not the crucifixion.